As odd as it might seem, I’ve never tried a fish taco before. I don’t really like a lot of Mexican-style restaurants (though I enjoy a lot of the Mexican food I’ve tried..) which means tacos aren’t normally on my wish-list. But.. then the food trucks came back to the MRU area when classes started this fall. 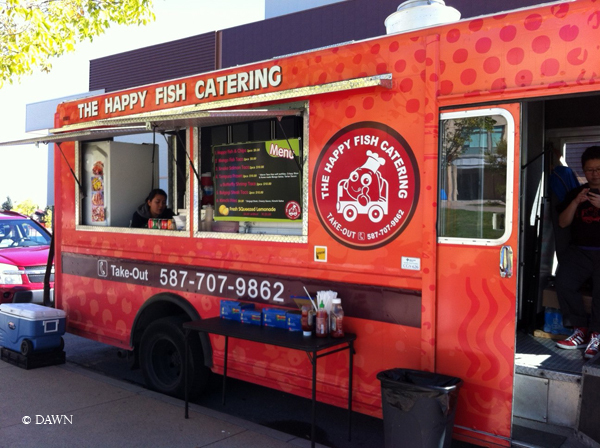 Most of the trucks are the same ones that have come around before (check some of my previous posts by clicking the Food Truck tag) so I haven’t written about them again, but one of the new ones this time around is the Happy Fish truck. 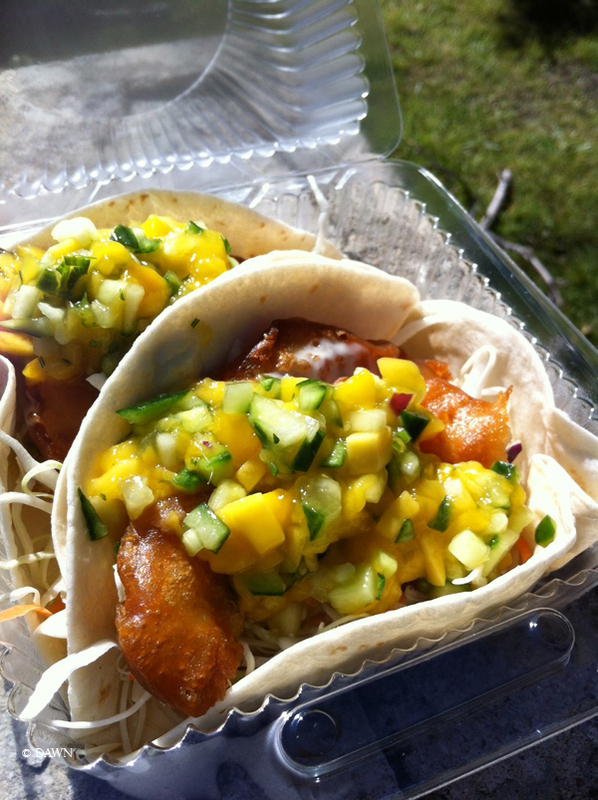 Specializing in… you guessed it- fish tacos! I opted for the Mango Fish Taco, which was pretty good – if this is what fish tacos are usually like, I’ve been missing out! 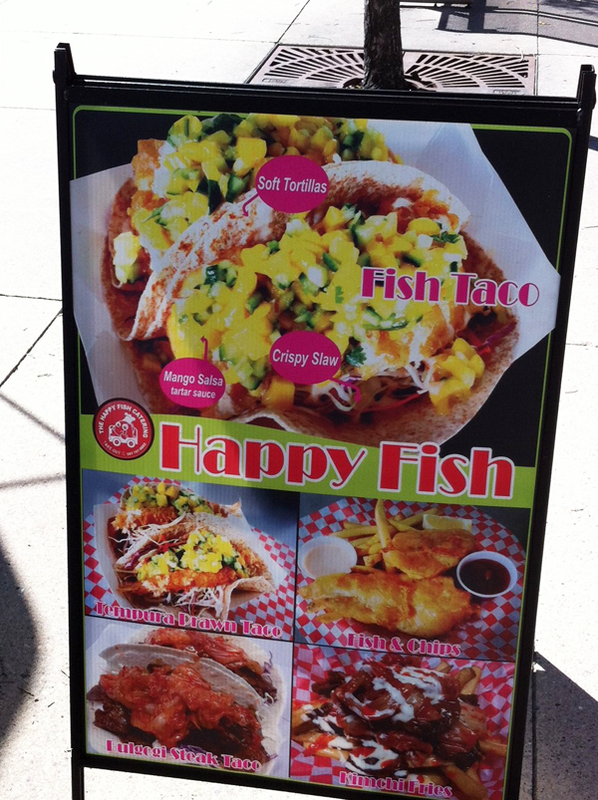 I’ll definitely check out Happy Fish the next time it’s on the MRU campus – here’s hoping the trucks come by year-round! The counter clerk was outgoing and friendly, and the food was good – I might even try the Kimchi Fries next time… maybe. You should totally try the KimChe fries and tell us how they are I don’t think I would try them though isn’t kimchee sour? That would be weird with fries. It might be – they haven’t been back unfortunately, so I haven’t had the chance to try them.